At CES, Conexant gave me a demo of some of the audio processing technology that they've been working on. Conexant is a company that probably has their technology in a product you own without you knowing it, and they focus a lot on SoCs for doing audio processing in everything from TVs, to smartphones, to IoT devices. One of the most interesting demos shown by Conexant is of their 4 microphone voice system to provide 360 degree direction detection. The company's CX20924 DSP enables this, and in their demo it worked quite well regardless of the angle you were at, and it even worked properly with multiple users speaking at the same time. While many devices can do this kind of detection, they often require arrays with 6-8 microphones, which can be cost prohibitive. Conexant claims that the system can work at a range of up to five meters, and it's able to tune out background noise in order to properly interpret your voice. This system could be used to drive down the cost of voice-activated devices by reducing the amount of hardware needed, and in my mind I can think of products like the Amazon Echo being brought to lower price points without sacrificing functionality. The second major announcement from Conexant is their CX20926 audio and sensor SoC. The chip consists of a Cortex M0+, along with Conexant's own audio DSP for voice processing. This chip is aimed at IoT applications and other battery powered devices like smartphones where a vendor is looking to implement always-on voice detection with minimal idle power consumption. The last announcement from Conexant is their RoomAware Optimizer sound processing for televisions. This feature has been included on LG's 2016 OLED and QD TVs, under the name Magic Sound Tuning. 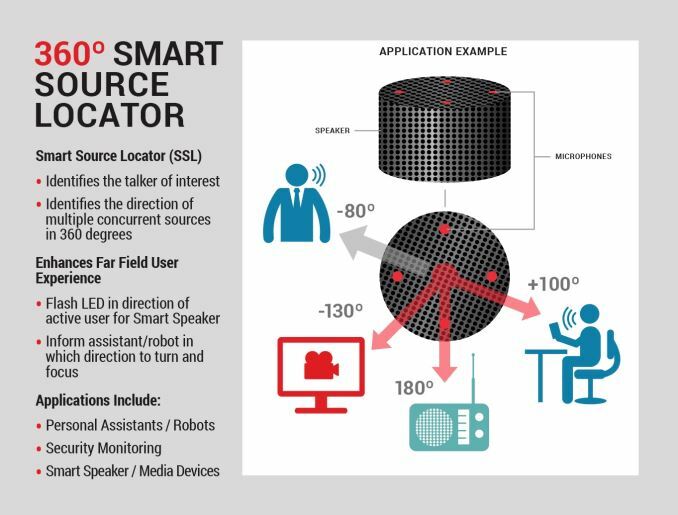 The technology uses microphones to analyze the acoustic characteristics of the room in order to tune the sound produced by the TV's speakers. While I wasn't able to get a demo of this feature, the fact that Conexant has already gotten adoption from LG shows that there's clearly interest in this type of tech from manufacturers and consumers. Personally I have crap hearing anyway due to many many operations on my eardrums and generally can't tell the difference in sound between systems. What time of day is it? Before 10 am on a weekend, when one parent is still asleep, the other parent spends time with the kids downstairs, with the TV on and volume set to 8 or less. That way, it can be heard in the one room only, without disturbing anyone upstairs. After 11 pm, when one parent and both kids are sleeping, the other parent will watch TV with the volume set to 11 or less, for the same reason. Check out Dolby Conference Phone it might surprise you with filtering ability. Disclaimer - I work for Dolby. Systems do that already. "Noise" cancellation on modern phones (at least high end phones) and BT headsets is pretty damn remarkable. If your speakerphone doesn't do that, it's because the speakerphone is crap 5yrs old technology, not because it can't be done.